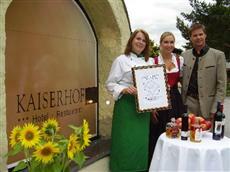 A heartfelt welcome to the Hotel-Restaurant Kaiserhof in Anif near Salzburg. With the restaurant and entrance area within ancient walls with lovely vaults you will find individually furnished nice rooms renovated to a contemporary standard. Business travellers, tourists and families always feel well with us. Reside comfortable in our Comfort, Comfort plus, Romantic and Family rooms. We may no longer accommodate emperors at the hotel-restaurant Kaiserhof in Anif near Salzburg, but you will be our royal guest. We have single, double, triple-bed rooms and four-bed rooms in the Comfort and Comfort plus categories. All 36 rooms were carefully renovated and individually furnished with much love. Indulge yourself at our lunch table and spend cosy evenings in Anif near Salzburg in our a la carte restaurant for 40 persons with an attached parlour (non smoker) and a further 40 seats in the restaurant (smoker). The cuisine is recommended with a rich selection of typically austrian dishes, and with wholefood and vegetarian fare on request.